The Audemars Piguet Royal Oak is one of the most famous watches ever created, and the Royal Oak Offshore is one of the most prized status symbols today. Nestled between these models is the non-Offshore Royal Oak Chronograph, a watch with a short, interesting, yet poorly-documented history, stuck between these high-profile offerings. Let’s take a deeper look! The Audemars Piguet Royal Oak was introduced in 1972, heralding the arrival of a new genre that thrives to this day. The Royal Oak established the market for high-end steel sports watches as a status symbol rather than a professional tool. It elevated the Rolex Submariner, Omega Speedmaster, and IWC Ingenieur and laid the foundation for the Patek Philippe Nautilus, Vacheron Constantin Overseas, and many more besides. And the sandwich construction, porthole look, and tonneau-and-bracelet design brought a new design aesthetic for the decade that followed. I featured this early “A-Series” Royal Oak in one of the first posts to this blog. The iconic design features an integrated bracelet, “sandwich” case with screws passing from the back to the octagonal bezel, the “tapisserie” dial, and the hexagonal crown. Although there were complicated Royal Oak watches, it wasn’t until the 1990s that a chronograph model was added. Perhaps no designer could figure out how to add pushers to Gerald Genta’s case design, or maybe AP simply lacked the right movement for such a watch. It is notable that the Ingenieur, Overseas, and Nautilus also lacked a chronograph option for decades. “The Beast” Royal Oak Offshore was the first chronograph model in the range on introduction in 1993 and paved the way for the Royal Oak Chronograph 5 years later. The first chronograph in the Royal Oak range was introduced in 1993 as the hefty Royal Oak Offshore. The central case component was extended on the crown side to serve as a pusher and crown guard. This creates an asymmetry that, while not quite pleasing to the eye, gives the watch a butch look in keeping with the overall Offshore aesthetic. The added subdials at 3, 6, and 9 clutter up the dial and obscure the signature tapisserie pattern, but this was always less of a concern when it came to the Offshore. Another big change was the use of a three-part “unibody” case, with a removable case back bolted through the “frame” to the bezel. In late 1997, Audemars Piguet announced a chronograph model in the classic Royal Oak line. Like contemporary “Jumbo” Royal Oak models, the case measured 39 mm across, and the bracelet and clasp had the proper classic look. Although equipped with one of the thinnest automatic chronograph movements ever created, the new Royal Oak Chronograph’s 11 mm thickness is obvious next to a classic 7 mm Royal Oak. The case is barely flared around the crown, much more subtle than the wide crown and pusher guards of the Offshore. The case was made up of two parts like the Royal Oak, opening on the bezel side, rather than a three-part Offshore type case. The original Ref. 25860 is 39 mm across the bezel and 11 mm thick. Notice the triangular marker at 12:00. This example is listed at €17,900 with box and papers. That movement, AP’s Cal. 2385, is based on the F. Piguet’s Cal. 1185 also used in the competing Vacheron Constantin Overseas and Breguet Marine chronograph models as well as some modern versions of the Royal Oak Offshore. This is the same movement used in every model in the Royal Oak Chronograph line to date. Now decades old, Cal. 1185 is an relatively-integrated automatic chronograph movement featuring high-end touches like a column wheel and vertical clutch with a one-piece reset hammer as well as micro-rotor winding. Less-modern aspects are the 30 Hz oscillation rate and 40 hour power reserve. Early examples of Ref. 25860 feature a sliding rectangular “AP” catch for the clasp, which is a single deployant type shaped like an open rectangle. Later examples have an “AP” shaped single deployant clasp. Still, the design of the Royal Oak Chronograph clicked. The asymmetric case was toned down, the tapisserie dial was retained, and the balanced chronograph registers were subdued enough to retain the Royal Oak look. Like other Royal Oak models, these have an integrated bracelet (many with contrasting gold inner links) and a single-fold deployant secured by a sliding clasp featuring the AP logo. Ref. 25860 was used for stainless steel models while Ref. 25960 refers to examples in yellow, white, or rose gold (25960BA, 25960BC, and 25960OR, respectively). Ref. 25978 is a diamond pave version. AP brought more of an “Offshore” look to the Royal Oak Chronograph for the 30th anniversary model, 2003’s City of Sails. This Ref. 25979 sports a nautical look with a swirling red “storm” (the logo of Americas Cup team, Alinghi, which was also being celebrated) in the 9:00 subdial and bolder colors. The traditional applied bar markers are replaced by chunky Arabic numerals and the “AP” signature at 12:00. Another major departure is the availability of a rubber strap with “AP” logo single deployant, though some are now seen with the traditional bracelet. TThe “City of Sails” model celebrated the 2003 Americas Cup team Alinghi as well as the 30th anniversary of the Royal Oak. Note the rubber strap, Arabic numerals, and swirling red logo. This example is available with box and papers for €12,900. Released as a limited edition, 1,250 examples of Ref. 25979 were produced: 1,000 in stainless steel, 200 in rose gold, and 50 in platinum. What’s odd about the City of Sails is that it celebrates two totally different things at once. The case back clearly proclaims “Royal Oak 30th Anniversary”, and the 2002/2003 release obviously tracks with the original Royal Oak of 1972/1973. Yet the back is also inscribed with an image of Americas Cup yachts with the text “City of Sails”. And the 12 hour totalizer features the logo of team Alinghi. So it’s meant for both the 30th anniversary and Americas Cup team. The 2003 “La Boutique” edition had a black PVD case and dial. A similar limited edition model is the Ref. 26014 “La Boutique”. On opening their flagship store at 40 East 57th St. in New York in 2003, Audemars Piguet created a limited edition Royal Oak Chronograph in black PVD. The dial is quite similar to the City of Sails, with Arabic numerals and the AP logo at 12:00. The back features an engraving of the boutique itself, along with the address. 150 examples of this Ref. 26014 were produced. The blacked-out look is reminiscent of the famous black Royal Oak favored by fashion designer Karl Lagerfeld, in keeping with fashion-focused New York. The Ref. 26300 (right) has an entirely new case but look almost identical to the previous Ref. 25860 (left). Note the round marker at 9 on the old model versus the rectangular one at 3 on the new. Although the look remains nearly identical, the Royal Oak case was completely redesigned in 2008. The new case consists of three parts like the Offshore model, with a separate caseback and bezel held together with screws through the case. This was the first refresh of the Royal Oak Chronograph model, and can be difficult to spot. One tell-tale sign is the shape of the markers at 3, 6, and 9 on the dial: The original Ref. 25860 has round markers there while the new 26300 has rectangular markers. Additional changes include a slightly wider bezel and redesigned bracelet. Some new models also feature contrasting paint on the tips of the subdial hands. All Ref. 26300-based Royal Oak Chronographs sport a single-fold deployant in the shape of the AP initials, regardless of whether they have the metal bracelet or rubber or leather strap. This is not a definitive indicator of the model, though, since this was also found on later examples of the previous model. This “panda dial” Royal Oak Chronograph, Ref. 26300, features subtle changes from the previous model, including square markers at 3, 6, and 9 and contrasting paint on the subdial hands. The bezel and bracelet are also slightly wider. It is listed on Chrono24 for $22,315. The reference number 26022 is used for precious metal versions of the Ref. 26300. This includes yellow gold, rose gold, and white gold as Ref. 26022BA, 26022OR, and 26022BC, respectively. Most gold models feature a rubber or leather strap rather than a gold bracelet. Ref. 26067, 26068, and 26127 are diamond pave versions with yellow gold, white gold, or rose gold cases. This Paris “La Boutique” model has a platinum case and square markers on the “panda” dial. Two different “La Boutique” models were created in 2005, this time for the Paris store. Founded by legendary watch impresario Laurent Picciotto, the Paris boutique edition was co-created with him. A titanium model, Ref. 26041TI, strongly resembled the New York model with Arabic numerals but with a gray case and dial. This matte-finish case is the first ever used in a Royal Oak model. The very-different Ref. 26035PT has a platinum case and white dial with contrasting black subdials. The markers on the platinum version are squares rather than bars and the AP initials are placed at 12:00. This gives a much more classic look than the New York model yet is still recognizable as something special. The elimination of the triangular marker at 12:00 presaged the future look of the Royal Oak. 100 examples were created in platinum with a rubber strap, and 50 examples in titanium with bracelet. A more significant refresh came in 2012, the 40th anniversary of the Royal Oak. The Royal Oak Chronograph was up-sized to 41 mm in keeping with the style of the decade and the 39 mm models retired. The new Ref. 26320 differs in almost every detail from its predecessor yet retains the same overall feel. The “grande tapisserie” dial pattern features wider spacing, the bar markers are longer (in keeping with the larger dial), and the look is more classic thanks to the larger dial. One major difference is the use of paired bars at 12:00 rather than the triangle marker used previously. The new 41mm Ref. 26320 has a more spacious dial with longer bar markers and double bars at 12:00. Note that the date window is evenly spaced between the 4:00 and 5:00 markers, unlike later models. I found this blue-dial steel example for $24,000 on Chron24. The case back has an inset circle around the “Royal Oak” text, unlike the smooth back on previous models. The bracelet was again redesigned, with a new “butterfly” style double-deployant clasp operated by transverse buttons under a large square AP catch. The fine new bracelet uses seven differently-sized elements, fitted perfectly together for a more secure and tailored look and feel. The new “butterfly” double deployant clasp has a larger square “AP” logo. The bracelet is further improved for a tighter feel. The Ref. 26320 was available in stainless steel, yellow gold, and rose gold as Ref. 26320ST, 26320BA, and 26320OR, respectively. Many of the precious model references include a rubber or leather strap. Ref. 26322OR is a rose gold diamond pave model. The “Leo Messi” Ref. 26325 features an eye-catching titanium bezel. The most-remarkable model introduced in 2012 was the “Leo Messi” Ref. 26325. An eye-catching tantalum bezel was paired with a smooth dial, creating an entirely new look for the Royal Oak. The Leo Messi was available with a stainless steel, rose gold, or platinum case as Ref. 26325TS, 26325OL, and 26325PL, respectively. Each version was a limited edition, with 500 steel, 400 gold, and 100 platinum pieces. These remain some of the most unusual Royal Oak watches ever produced, and the steel version is especially fetching. The steel version originally sold for $30,800. Two more limited editions were released in 2015. The Ref. 26326 “Tribute to Italy” features a steel case, rubber bracelet, and black on white “panda” dial. The minute counter at 3:00 has red, green, and white markers in reference to the Italian flag. This was limited to 500 pieces and priced at $31,000. The Ref. 26327 “QEII Cup” has a grade 5 titanium case with a gray on gray “panda” dial. A rubber strap gives it a sporty feel (along with the light weight). Just 200 were produced to commemorate the Queen Elizabeth II Cup horse race, priced at €27,400. After just five years on the market, the look of the Royal Oak Chronograph was radically altered. A change to the subdial layout really transformed the look: The chronograph counters at 3 and 9 were enlarged, with a bold chapter ring, reducing the running seconds subdial at 6:00 and shifting the date aperture slightly. This layout of subdials is at once balanced and asymmetric, adding tension to the subdued Royal Oak look. The controversial relocation of the date window was necessary to maintain even spacing between the larger chronograph minutes subdial and small seconds, but has been quite polarizing among enthusiasts. Other changes abound. A new font is used, and the AP signature is enlarged. The hour markers were widened, allowing for more luminous paint, as are the hour and minute hands. The markers are also shortened slightly. Finally, the bracelet was somewhat redesigned. The Ref. 26331 is available in a variety of materials and dial combinations. The base stainless steel model, Ref. 26331ST, comes with blue, black, and “panda” dials. The rose gold Ref. 26331OR comes with a blue or brown dial with a metal bracelet or alligator leather strap. The only yellow gold Ref. 26331BA model features a blue dial. Rarer models are the “frosted” white gold Ref. 26331BC and one-off platinum Ref. 26338PT (a unique piece of One Drop Foundation), both with a purple dial. The steel models list for $24,300. The rose gold models cost $56,600 with bracelet or $38,300 with leather strap, while the yellow gold is $61,900. The frosted white gold model is $63,300. A special 20th anniversary edition, Ref. 26331IP, has a titanium case and polished platinum bezel and middle bracelet links. The dial is slate gray with blue subdials. 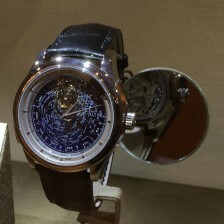 500 pieces were announced on launch at SIHH 2007, priced at $42,699. The latest addition to the Royal Oak Chronograph line came just this year. The 38 mm Ref. 26315, though the smallest Royal Oak Chronograph to date, marks a return to the “Jumbo” dimensions of Genta’s original design. The look also marks a return to the classic symmetric subdial design of the original Ref. 25860 and serves as a counterpoint to the “big eyes” Ref. 26331. The only design miss is the location of the date subdial: Perched at an angle, it’s slightly off-center like its bigger brother, closer to the 5:00 marker and small seconds than the 4:00 marker and minutes totalizer. The 38 mm Royal Oak Chronograph is available in steel with a blue on white dial or rhodium on ruthenium dial as Ref. 26315ST. It is also available with a pink gold case with silver dial as Ref. 26315OR. All models include a matching metal bracelet. The steel models cost $23,800 while the gold is $52,700.